In a discussion with a friend recently, I recalled my childhood's favourite pastime of collecting things - stamps, little metal cars, even empty beer cans (﻿after the fall of the Iron Courtain, when the market had been flooded with Western beers of sorts and the aluminum cans were an all-time novelty). Over time, the collections reflected newer interests of mine: airplane models, Italian silk ties, writing instruments; such collections took a life on their own, got wings and reached new heights, before my interests shifted onto objects that - perhaps - held a greater value in my eyes. Thus I began collecting other objects that will undoubtedly form a permanent presence in my life: books. Since times immemorial (ok, I'm exaggerating), I remember my interest in reading - since I couldn't travel (travelling abroad was a luxury reserved to a select few people of privilege), I have sought refuge in the stories, adventures and dreams captured within book covers - themselves embellished with vivid pictures, depicting glimpses of the lands within, other more "mature", leather-bound and with discreet decorations of floral or geometric patterns. My dream, in fact, is to own a great library where friends can find both sanctuary and inspiration. Thus have some objects stayed with me for a long time, and it's very likely they will continue to enrich my existance in countless ways. 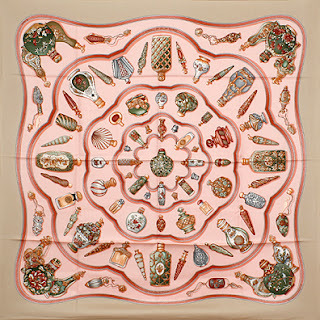 To reflect the true spirit of collections, "Flacons" ("containers") features a series of bottles used by apothecaries to hold and offer medicinal potions or beauty liquids. Each one, in its creation, became a piece of art in itself, becoming a testament to the artists' creativity and craftsmanship. 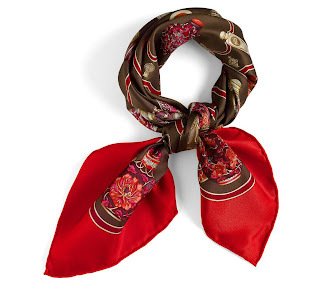 A classic scarf that ties beautifully (while the scarf displays wonderfully, it is the knot that captures the essence of the container's beauty and mistery).